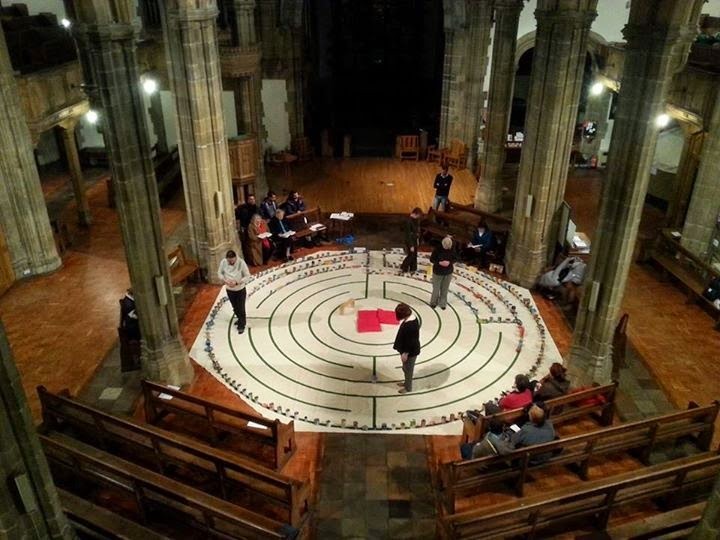 This Holy Week, we have installed a (borrowed) labyrinth in the middle of the nave. Labyrinths have a long tradition as an aid to meditative walking. They can be found permanently marked out in the floors of cathedrals, or temporarily laid out in canvas on the floor of the Minster. But to an ancient tradition, we have added a contemporary twist: inviting people to bring items for the local food banks, and to place them along the edge of the path. For God may be encountered both in suffering and in compassion; in desperate circumstances, in the face of the one who has need to come to a food bank, and in the face of the one who volunteers there. The labyrinth is available for unguided walking throughout the day (9am-3pm) but also in led meditations (7.30-8.30pm Monday, Tuesday, Wednesday; 12-2pm Good Friday). Last night I introduced the idea to those for whom it was new, by walking the labyrinth with a commentary of my experience walking it earlier in the day. There is no prescriptive way of walking, but a common one is to walk slowly into the centre releasing something to God; to spend time at the centre receiving something from God; and then to walk slowly back out to the edge, returning to the everyday world beyond. That said, it can also be good to walk with no agenda, and simply for the sake of setting aside time in the presence of our own body – this is a tactile experience – and God and those around us – this labyrinth is easily big enough to take nine or ten people at any time. I began by reading, slowly, prayerfully, through the Passion narrative in Mark’s Gospel; asking the Holy Spirit to give me a word to carry into the labyrinth, to turn over in prayer. Short words, one or two syllables, spoken with each breath in and out, can be an aid to reflective prayer. The word that ‘caught’ as I read was ‘naked’ – when Jesus is arrested, a young man wearing only a linen robe is caught, but wriggles out of his clothes and runs away naked. I took off my shoes – a practicality, to protect the canvas; but also a recognition of being on holy ground, and part of the tactile experience – and stepped into the labyrinth, slowly turning over the word naked, naked…naked I came from my mother’s womb and naked I shall return – the words that came into my mind are those of Job, when catastrophe robs him of his identity in work, of his identity as a father, and almost of his identity as a husband. But not of his identity as one who receives identity from God, in gain and in loss, in blessing and in suffering. As I continued to walk, I reflected on this, on the reality that we bring nothing and take nothing with us, on how that challenges our assumptions about privilege and entitlement. Things in my society – and in me – that I needed to release to God. Walking a little further along the path, still meditating on naked, I was hit by the word shame. Not shame concerning physical nakedness, but the shame of being stripped of the image we construct and present to the world. The shame of having to go to a food bank. The precarious shamelessness of the powerful – including myself. Here was more to release to God, and an exploration of the ways in which I ‘dress’ myself, present myself, so as to hide rather than reveal my true self. Arriving at the centre, I knelt and continued to pray, asking to receive. Almost immediately, Jesus spoke to me about the sheep and the goats (Matthew 25). Not in terms of ‘this is what you ought to do’ but as a fresh revelation that Jesus fully identifies with those who are naked, with those who are hungry. Not only with those who are these things physically, but also with those who are naked and hungry spiritually. That in my recognition of my own nakedness, and that of my society, Jesus was to be found. And then another passage from scripture came to my mind – the more familiar we are with scripture, the more God can speak to us through scripture – Zechariah’s vision of the high priest Joshua (coincidentally, the Hebrew version of the Greek name Jesus) standing in filthy robes and being accused by Satan (satan means, the accuser). But God rebukes the accuser, and commands that Joshua’s filthy robes be removed and festal robes put on him, symbolising that God has dealt with his guilt. The vision continues with the promise of a day when God will remove the guilt of the nation in one day, and when each one will invite one another to sit under their vine and fig tree. In other words, a sudden and decisive change, and a sharing of resources. It felt like a commissioning, both personal and corporate, to live out that vision, to live as those whose own guilt has been dealt with in order that we might be generous with our resources. And so the walk back out from the centre to the edge was a prophetic act, a response, a returning for the world God loves and for which he gave his Son, even though we rejected him. And the reality is that it is hard to live that way on a daily basis, and that we need such moments when we can struggle to release into God’s hands what we ought not to carry around as a burden; receive from Jesus that which he wants to give us instead; and return to the world to share what we have received with others. I know that other people have had experiences every bit as significant, and even more so. And for those who have not, the very least that has happened is that they have sat prayerfully in God’s house, and perhaps read through the Passion narrative – and that in itself is a significant moment. The Labyrinth For Our Times is a real gift to us, and from us, this Holy Week. The finger Labyrinth is another form of tactile prayer, moving the index finger along a path. The Labyrinth is an ancient representation of the experience of the life of faith. A single, unbroken path wraps around a centre-point. Unlike a maze, it has no false starts, no dead-ends, no high walls or hedges to block our view. You cannot get lost in a labyrinth: as long as you keep going, you will reach the centre, or return to the edge. You cannot get lost in a labyrinth; but neither can you take a direct route. Aiming for the centre, the path brings you close, only to take you away again. Setting out for the edge, the path folds back on itself, as if you have forgotten something. It takes trust to follow the path. 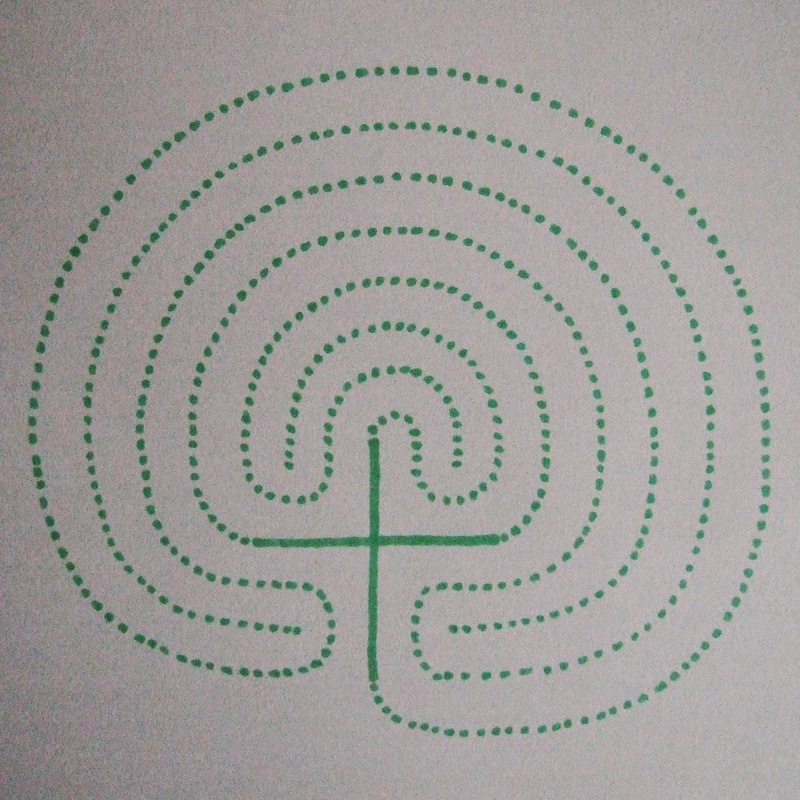 One way to trace the labyrinth is to imagine Jesus at the centre and to move towards the centre meditating on his words ‘Come to me’ (or, ‘Come to me, all who are heavy-laden, and I will give you rest’ or, ‘Follow me’), and then, having remained in the centre for a while, to move outwards towards the edge meditating on his words ‘Go … and make disciples’. This two-fold movement summarises the heart of the gospel: repent, and believe; return, and be sent; come in, and go out. There is a thing that happens in the life of faith, where the path takes a turn away from what we expected. It often happens for the first time after an initial flush of enthusiasm and excitement, where everything seems more intense than before, gives way to the costly work of everyday life. It happened to Jesus’ first disciples, when his words and actions, so compelling to them, start to be met by hostility. It happens to newly-weds; or new parents; or those (like me) who have been in a new job or project long enough to question whether they were right to have taken it in the first place (and yes, it was the right decision; that’s the point, of pressing on). And it isn’t a point we move past as we grow more confident, never to return to a similar situation. Jesus tells his disciples that they will all desert him – that they must desert him; that it is the only way to ensure that what Jesus has entrusted to them will survive – and that once they have deserted him, they will be restored, first Peter, then the others. In other words, the path of following Jesus turns away from Jesus and then turns back towards him again. Trust the path: for Jesus himself is the Way. It happens when we experience illness, or discouragement, or any circumstances that overwhelm us or frustrate us … and sometimes it happens for no discernible reason at all, other than that we aren’t the one who has set the path. This wrinkle, this see-saw, is given voice – often understood only with hindsight – in the Psalms and the prophets, again and again. This turning away is an essential part of the walk – and the labyrinth expresses that, reminds us of that reality, over and over. When God seems further from us than before, when God seems behind us rather than before us, just keep putting one foot in front of the other, keep that index finger pressed onto the page. There is a well-known poem about someone walking along a beach with Jesus, and turning at length to look how far they have come, only to notice that at the hardest times in their life there is only one set of footprints in the sand. They ask Jesus why he left them when they most needed him; and Jesus replies that those are his footprints, the times when he carried his friend. I don’t like that poem, because we were never meant to walk with Jesus on our own, but in community. Likewise, labyrinths make pilgrimage possible for those who lack the means; but pilgrimage is not meant to be done alone. Like the journey of faith it represents, walking labyrinths is best done in close proximity to others. Even finger labyrinths – so small that only one person can trace them at a time – are best traced in company, with sharing. Prayer beads are common to several world religions as an aid to prayer. I recognise that they aren’t for everybody, but that doesn’t mean that they aren’t helpful for some, both as a very simple repetitive action of the body while praying and as a meditative approach to prayer. As one or two people have asked me about my experience, I thought I’d post these reflections. Christ is still on the cross. For the Gospel writers point out that the cross is the throne of glory, and Christ is seated on that throne. He is no longer in agony, no longer drenched in sweat and blood, no longer held by nails; but he has not discarded the cross as you or I might discard something we have used and no longer have use of; nor has he left it as empty wood to become a sentimental totem. He has transformed what was intended for evil into a thing of beauty; the locus of pain into the locus of healing and wholeness. That is what Christ does. And he calls on us to take up our cross and follow him: to embrace and to transform, not to defeat and discard. We do not get to lay our cross down. Instead, we get to fashion it into a throne, that tells the story of God's faithful loving-kindness and covenant commitment to us. How do we fashion it so? By responding to that love, day by day. The other two Celtic knots are ‘Our Father’ beads: that is, the time of prayer is framed by the Lord’s Prayer. I find it significant that these prayers are all prompted by an empty space described by an unbroken thread, for it reminds me that I nothing and bring nothing, except that I am held together by the beauty of God’s love, and that is enough. And then there is the ‘week’ of beads. 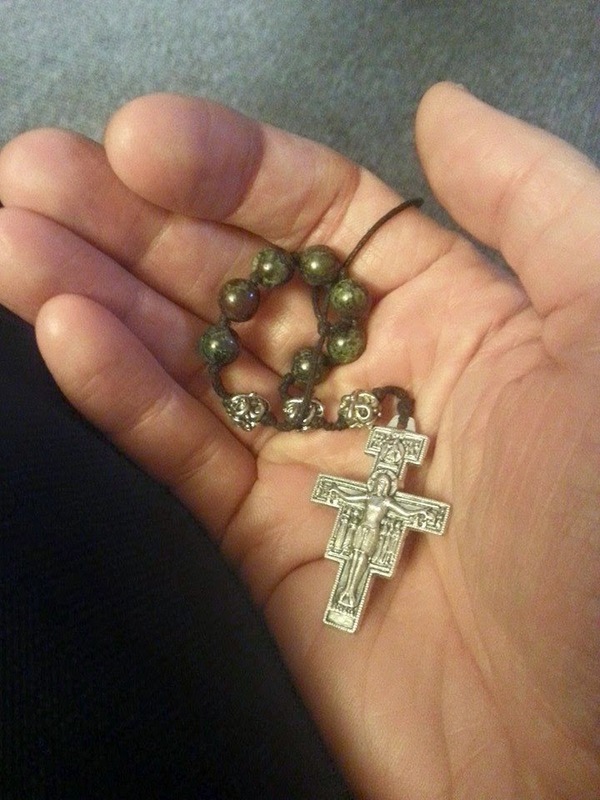 There are no prescribed prayers to Anglican beads. Most commonly, these might be used repeating the Jesus prayer – ‘Lord Jesus Christ, Son of God, have mercy on me, a sinner.’ – perhaps emphasising a different word or phrase within the prayer on each bead. But this Lent, as we at the Minster have been exploring themes of healing and wholeness, I have simply prayed ‘healing and wholeness’ over again – for myself, for my community, for individuals, for the wounds of the world … As I have done so, I have been stuck by the thread that holds the beads together: healing and wholeness take place most fully in the context of being held together in community. That, then, is a little something of my experience of a practice that is new to me, but one that I’m finding worthwhile. A gift from one tradition within the Church to another. I’ve been finding Morning Prayer especially fruitful recently, in the unpromising ground of Lenten readings through the prophets. I posted these thoughts on Facebook at the time, but Facebook is no way to archive anything, so thought I’d copy these over here for the record. It is a tenet of classical Anglicanism that an honest reading of Scripture will point us to Jesus. This morning at Morning Prayer, we read Jeremiah 14, an exchange between the prophet Jeremiah and God, where God pushes back hard against Jeremiah. It makes uncomfortable reading. I was reminded of how Jesus pushed back at people, in order that they might make a step in faith - women were particularly good at engaging with this. Might it be that God says things that are not the final word, or even necessarily revelation of God’s true view, but that push us to discover something that we would not discover except in the struggle? In Jesus, God responds to our deepest longings, beyond what we can articulate. At Morning Prayer today we read Isaiah’s vision of one who would work an incredible reconciliation (Isaiah 11:1-10). But Isaiah imagines that ‘with the breath of his lips he shall kill the wicked.’ – an idea born of Isaiah’s frustration and pain, and in contrast to the tradition of God’s breath breathing life. In fact, Jesus fulfils Isaiah’s deepest longing by giving up his breath, his spirit, into God’s hands and being assigned a grave with the wicked, that the wicked might live. Don’t be afraid to articulate your fear and anger before God, or worry that we are ourselves conflicted: he is big enough to take what we bring and use it by transforming it into a work of reconciliation far greater than we have yet known or can imagine. The primary school I went to is located at the bottom of a hill, with a wooded slope rising behind two of the three school buildings up to the road. My strongest memories of primary school are connected not to the classroom but to that little strip of wilderness. We used to play ‘army’ games there, pushing our way into thickets hoping not to be discovered. Needless to say, we weren’t allowed to play in that part of the grounds: it was considered too dangerous. But of course, it was safe: the fence kept anyone who ought not to be there out – even if we ourselves climbed over the fence to run to the nearby park at lunch time, running back at the ‘first bell’ in time for the ‘second bell’ – and if anyone did get hurt there were teachers close at hand. When caught, we lied shamelessly to avoid punishment, morally obligated to disregard unjust rules. One part of the slope was not wooded, and in the winter we used to carry cold water in Tupperware boxes to the top of the slope at first break, pouring it out to create an icy runway by second break. Then we would take a run and launch ourselves sliding down the hill. This, too, was frowned upon, if not outlawed. If I went back today, the slope might barely seem like a gradient at all. At the time, it was an adventure. In my memory it is written large – not because my memory is faulty, but because my memory is accurate in a non-factual way; because it was written large at the time. When you are a kid, you think that the world will get bigger – will open up before you – when you are older: when you can drive instead of needing to be driven. But when you get older, you realise that the world has in fact in many ways grown smaller: when I was a child everything was magnified not so much by my relative shortness but by my sense of wonder at the world. It’s not that I became boring (as my own kids might assume, quite possibly correctly), but that we become knowing. Familiarity breeds contempt, as they say. Ironically, wonder is the casualty of so much formal education, which prepares us to live not in the real world but the adult world. The wilderness is a place of prayer. By the time Jesus heads into the wilderness, a thousand years, give or take, after David, the wild places have been plundered for their timber. No-one would appreciate this more than a carpenter, a labourer in the construction industry, the work of whose hands in a very literal sense extends civilisation at the cost of the wilderness. Again, civilisation – external and internal – is not bad per se, but has a cost – and must have its limits. At first glance, the wilderness is a lifeless place. Look again, more closely, and you discover that it is full of plants and animals that have adapted in order to make this place their home. From a scientific viewpoint, this can be described as evolution (and from a theological perspective, evolution describes how life has responded to God’s invitation to be fruitful and fill the earth, every habitat). From a theological viewpoint, the same adaptation can be described as every living thing looking to God, and receiving all its needs from God’s hand. In short, the desert lizard, the ibex, the jackal, at prayer. It is into the wilderness that the Holy Spirit leads – or even drives, with urgency – Jesus, that he might pray with the wild animals. That he might learn from them, at home in their dependence on God. How, then, do the wild things pray? in a shrinking ecological footprint where resources are reduced and life squeezed by the actions of others. That is, the wild things pray: Our Father in heaven, hallowed be your name. Your kingdom come, Your will be done on earth as in heaven. Give us today our daily bread. And forgive us our sins, as we forgive those who sin against us. And lead us not into temptation, but deliver us from evil. What does it look like to pray from within our wild places? Really, to deny our self-sufficiency and to repent of – to turn away from, to head in a different direction – competing with one another in order to satisfy our desires. But how might we pray in the wilderness, where we are confronted with our inability to do anything, including prayer? Wilderness prayer is simply being before God, perhaps even wordless like the wild animals; finding ourselves in a place where God searches us out and finds us in his love for all that he has made. In the wilderness, Jesus wrestles with the temptation to provide his own daily bread; to claim the pinnacle of human achievement, in cultural grandeur and societal power; and to embrace an all-encompassing civilisation that imposes itself on the wilderness, crushing all non-conformity. The wilderness stands as a testimony against such glittering folly. Far from judgement passed on a failed or failing life, our wild within is a precious gift. Perhaps it is only from that wilderness that we can resist what would ensnare us. Perhaps that is why the Holy Spirit drives Jesus into the wilderness. Perhaps that is why we follow. Today parts of what remain of the Judean wilderness are protected as National Parks. Might we learn also to protect and value our internal wilderness? The wilderness is a place of refuge. A thousand years after Abraham passes through the Judean wilderness, his descendants have claimed the land as their own. They have spent half of the intervening millennium beyond its boundaries, while the earlier settlers continued to tame it, and, not long before their return, another people had invaded from the sea and settled the coastal plain. Then the return, invasion and conquest of cities, assimilation and struggle with other tribes, the emergence of nationhood, power struggles to decide who will rule. Bronze Age settlements have given way to Iron Age federations. These are turbulent times. Though the farmable land has been opened up, the wilderness is still wild. The account of one hard-fought battle records that more men were killed by the forest than fell to the sword. And it is in the wilderness that we find David, having fled the madness of King Saul. David, finding refuge in a cave system large enough to shelter several hundred men. It is in the wilderness that, some generations later, we find Elijah, having fled the wrath of Jezebel. The wilderness is the place of the outcast, the outlaw, the person who is being crushed by the way in which their society is ordered; who needs to run somewhere where they will not be followed, or, even if followed, will not be found. David exchanges the royal court for the wilderness in order to live, to secure an ongoing existence. Not escapism, but survival. Elijah pushes into the wilderness in order to die, having had enough. Both men are followed, and found, by God – and by those sent to them by God. In a cave very near to the lowest place of earth – physically and metaphorically, external and internal geography coinciding – David discovers that God is his rock. From the mouth of a cave in the wilderness, Elijah, having been sustained and strengthened, encounters the whisper of God in the sheer silence that follows wind, earthquake, and fire. The wilderness is a place of refuge. There are times when we need to get away, out into the countryside, encountering God in creation, away from the treadmill and the rat race. And there are times when we need to shut the door on the world and head deep into the wilderness within, the untamed and untameable self. Times when we head into the wilderness in order to protect ourselves; and, perhaps, times when we head into the wilderness where that deepest part of us that desires to live – where God’s words releasing life into the world still reside - wrestles with the weight that presses in on us to die. By day, the wilderness can be breathtakingly beautiful; wandering through it, an invigorating experience, certain trails and landmarks becoming familiar friends. By night, or caught in a forest fire, it can be a disorienting and dangerous place to be: what monsters lurk just beyond our vision? Will I flee the sword, only to hang caught from a tree? Likewise, our experience of the internal wilderness will vary, from restorative visit to ordeal. Then again, the Psalms remind us that cities – our engaging with civil society – can be places of bewildering treachery and painful struggle. The wilderness itself becomes less threatening when we appreciate it as part of God’s creation: as a home and provision for the wild animals, including that within us that needs to break free. And when we recognise that God, the most fierce and free being of all, is more at home in the wilderness than he is in a temple. As a boy, David encountered lions and bears; learnt how to scare them off – and, if necessary, kill them – with a sling. Of the wild and dangerous places between the open spaces, he sang of a Shepherd who carried two sticks: one held along the flank of a sheep to steer it back onto the path; the other, a cudgel with which to drive back predators. Have we become too domesticated to walk through the wilderness with confidence? If we deny the wilderness within us, we are also more likely to avoid the wilderness in other people, the wild and lonely places they disappear into from time to time. We stand at the edge, praying that they might return to civilisation. Perhaps we would do better attentively waiting on God, should he send us into their wilderness after them, with a message, or aid. I am not suggesting that we take the role of unqualified psychiatrists, psychologists, or psychotherapists – that would be dangerous folly; and there are times when we need such professionals – but rather that faithful friendship involves such a willingness. That through us, not only is the wilderness blessed, but it becomes even more fully a place of blessing.